The dynamic of the northwestern fur trade was different from what was observed in the south and even around the Great Lakes in several ways. One of these was the contrasting patterns of migration. The wintering partners of the NWC and their Montreal-based competitors struggled across hundreds of miles of river, rapids, and portages with their long freight canoes in order to reach Lake Superior every spring to hand over their furs and collect new trade goods. Then, after a relatively brief stay, they’d return to the northwest. This ordeal would take the better part of spring and summer, depending on how far into the region their trade post was located. Similarly, the HBC traders in the field after 1775 raced across the North each spring and summer to reach Hudson Bay before the ice arrived. Aboriginal people, for their part, might journey long distances once a year to trade at the post before heading back into their home country to, among other things, capture more fur-bearing animals. In other words, the trading post, depending on its size and importance, might be the focus of concentrated activity for a brief part of the year and more or less abandoned at other times. The larger forts, however, offered a different scenario. Home guards were established on or close to their doorstep, a reliably accessible source of labour, food, and intelligence for the Euro-Canadians. For the Aboriginal community itself, proximity to the fort gave them control over which other Aboriginal traders might gain access. It was in the context of these two broad types of interaction that a fur trade society emerged. In cases where there was an established home guard, the Europeans and Canadians had to concede that their ability to trade was limited. The HBC could claim to have a monopoly but so too might the Cree home guard. In the late 18th century, when northwestern peoples began to sour toward the traders, the home guard bands constituted an important line of defence: they were allies whether the HBC wanted it to be so or not. The head office in London, however, wanted to keep Aboriginal partners at arm’s length and was particularly critical of romantic and/or sexual relations between the personnel and Aboriginal women. At the smaller posts farther inland, the situation was a little different. From the viewpoint of the European, marrying an Aboriginal trader’s daughter (or wife or sister) meant that the band would return reliably each year with new shipments of furs; from the perspective of Aboriginal people, intermarriage ensured privileged access to European products. Aboriginal women also brought with them skills necessary to succeed in the fur trade and the northern environment. They manufactured snowshoes, moccasins, tents, mitts, and other goods without which the European trader would do badly — if not perish. Of course, they also provided a sexual partnership and an intimate human relationship — without which the European trader might despair. The benefits arising for Aboriginal women were considerable. They had direct and generous (though rarely unimpeded) access to trade goods, many of which were designed to ease the work of women in particular: cooking tools, sewing needles, and knives figured high on this list. The children born of these unions did not follow a singular path. In the 18th century the HBC denounced and forbade liaisons between its servants and the Aboriginal peoples, which may have simply driven the practice into the shadows. There were substantial numbers of children at the forts around 1750. By 1800 other solutions were being explored, including resettlement of the offspring. Daughters whose fathers were important officers in the HBC were married when they reached adulthood to young European traders. They were thus drawn into a complex kin network that stretched to, perhaps, the Orkney Islands on the one side and the Coppermine River on the other. For reasons associated principally with the structure of year-round life at HBC posts and with the HBC management’s efforts to limit intermarriage, these relationships developed along lines that favoured British influences in important ways. The offspring of intermarriage involving the HBC, in short, developed identities that were more strongly British than not; some, however, were utterly Aboriginal. But there was not much in the middle. The contrast with the Canadien-Aboriginal experience is sharp. In the more transiently populated forts on the French/Montreal frontier around the Great Lakes, it was more likely that Canadien traders would return to Canada annually or after a few years in the field. Relationships under these circumstances were more casually structured and a female partner would sometimes be handed on to a retiring trader’s successor. As postings in the West lengthened and particularly as succeeding generations of voyageurs/winterers became more contemptuous of the soft life in Canada, marriages were more likely to be at least confirmed à la façon du pays (in the custom of the country). As the influence of the clergy in the West increased, clergymen sometimes also formalized them further with conversion rites and the sacrament of marriage. In the French and then the post-Conquest Montrealers’ posts, intermarriage and miscegnation occurred regularly enough to become a concern for both priests and managers. There were so many offspring (and widows and abandoned wives) of traders living in and around forts from Detroit north through Michilimackinac, Fort William, and onto the Plains that the NWC was regularly faced with requests for support when its men left the field. The Catholic clergy played an important role in the socialization of the Métis (“mixed-blood”) children and by the late 1700s there were sufficient numbers — a cultural critical mass — to generate a distinct group of people. A sure sign of the emergence of a self-sustaining culture was the appearance around 1800 of a Métis language, Michif, which mainly combined French nouns with Cree verb phrases. (This was an almost unique phenomenon in North America which, outside of the Russian-Aleut communities in Alaska, constitutes the only true “mixed language,” as opposed to a trading dialect or a pidgin. By contrast, Bungee arose around the English-speaking settlements of Red River, layering elements of Anishinaabe/Ojibwa atop a substantial foundation of English and Gaelic to create what linguists call a “creole.”) Michif, along with a distinctive style of dress, manner of living, and awareness of shared interests, set the Métis apart from their Aboriginal and European cousins and sent them down a path toward nationhood in their own right. Between 1800 and 1820, the Métis advanced their own economic interests as carters, voyageurs, farmers, bison hunters, trappers, and manufacturers of pemmican. 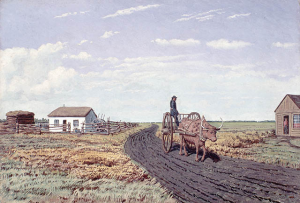 Their great technological contribution to Western life — the Red River cart — enabled the Métis to freight large quantities of pemmican and trade goods across the open prairie and even across rivers, something that was beyond the means of Aboriginal and European traders alike. It was the pemmican trade that became the Métis niche, especially in what is now southeastern Manitoba and North Dakota. It was to define their relationship with newcomers on the northern Plains and it would become an important part of the “New Nation’s” identity. The terminology used to describe liaisons between European men and Aboriginal women has evolved a great deal since the contact era. In 17th century New France, there was enthusiasm at official levels for building a colony of people drawn from both societies (so long as they were Catholic) and there was, as a consequence, little opprobrium attached to children who were the product of miscegenation. In Spanish colonies the term for the children of native and European parents was (and is) mestizo. In French colonies the term most often used today is métis. Note that it is not capitalized in this instance, because it describes a heritage, not a culture. When métis people in North America achieved a consciousness of a separate identity, they became Métis. So, it is possible to speak of someone who is métis but not Métis. Most, but not all Métis (and métis too) were the descendants of French and French-Canadian traders and Aboriginal women (mostly Anishinaabeg or Cree). By contrast, the children of British men and Aboriginal women were described in a number of ways. Historians, looking at that population retrospectively, use the term country born. There was a time when half-breed was not necessarily a derogative term, but by the middle of the 19th century it very commonly was. As notions of race and immutable race differences became more widespread, the terminology became more derisive and was hurled as an insult. Other terms such as bois-brûlés (which means “burnt wood”) was used by francophones and still occasionally makes an appearance. Métissage is an attractive word sometimes used to describe the mixing of European and Aboriginal cultures in these populations. It is certainly a better choice than mixed-race marriages,” which perpetuates obsolete and discredited notions of racial categories. The Western fur trade in the early 19th century was long-ranging, defined by chains of forts and posts that covered thousands of kilometres and created many intersections for different peoples. 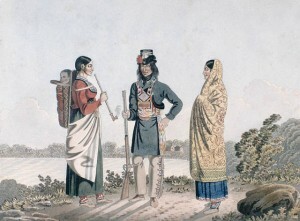 Relations between Aboriginal and European/Euro-Canadian participants in the fur trade frequently included sexual and/or marital partnerships. 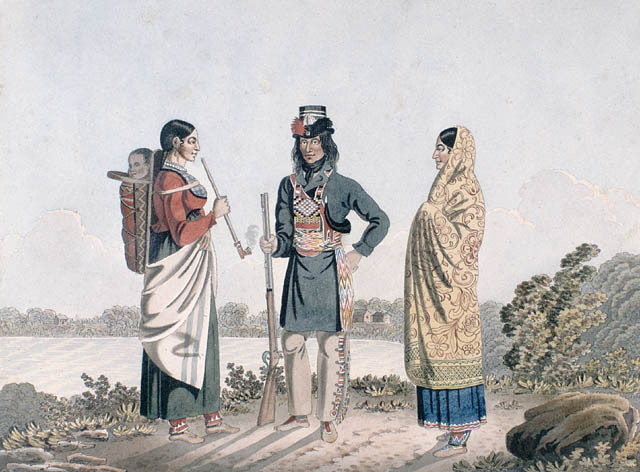 The role of the Aboriginal and métis women in these relationships was often critical to the success of the fur trade business. The people arising from these relationships began to define themselves as different from both Aboriginal and European ancestries. A halfcast [sic] and his two wives / Un Métis et ses deux épouses by LibraryArchives is used under a CC-BY 2.0 license. 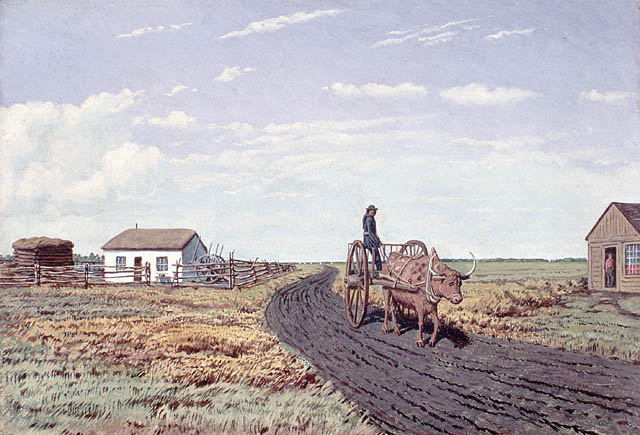 Manitoba Settler’s House and Red River Cart by Geo Swan is in the public domain. 8.8 Fur Trade Society and the Métis by John Douglas Belshaw is licensed under a Creative Commons Attribution 4.0 International License, except where otherwise noted.